Any of these words will serve to describe an Anamika Khanna saree. With excessively experimental designs that shock you and make you covet them at the same time, Anamika Khanna is a celeb favorite. Her saree designs are meant for gutsy women with the ability to pull them off. One such totally gutsy fashionista, who is open to every fashion statement to ever grace space in a glossy is Sonam Kapoor. 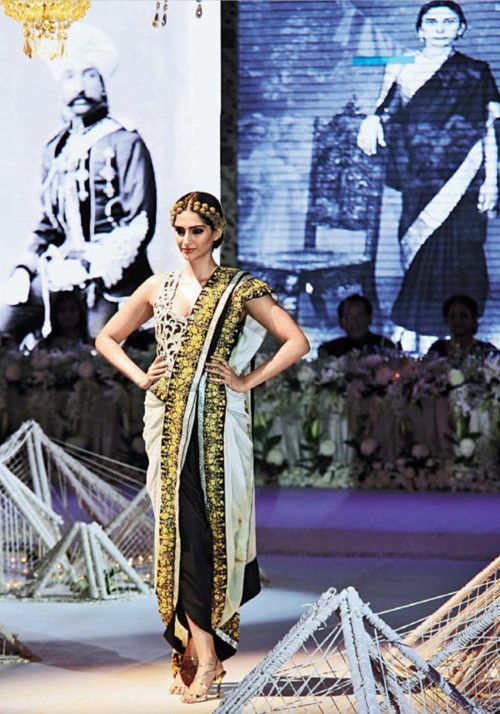 She endorses Anamika Khanna’s creations with zeal. She literally goes everywhere in them. Knowing Sonam Kapoor likes them makes me rest a little easy, because that girl is never wrong about what she wears! Another celeb known for her fashion sense has been spotted in an Anamika Khanna design – Soha Ali Khan, who wore a gorgeous saree hybrid for her own brother’s wedding. Making a fashion statement is no time to be coy and boring. If a bang is what you are looking for, an Anamika Khanna is the perfect choice as there’s nothing coy or boring about her style! Let’s start with her characteristic saree hybrid (which is what I will call it for the want of a better word, especially since “saree” doesn’t seem to cut it). Reminiscent of a half sari and a dhoti of the same time, this saree design shuns the usual flowing nine yards for a little dhoti-esque action. The drape of the pallu immediately makes you think of half saris, especially with the seemingly careless way in which it’s tossed over the shoulder, almost in defiance of tradition. Anamika Khanna uses the cuts and flows of this design to her advantage by highlighting them using contrasting colors. She provides a border and a direction in which the eyes will move when someone sees you for the first time in an Anamika Khanna creation. This border is thick and embellished, sporting a never-seen-before design. Anamika Khanna pairs her saree hybrids with bandh gala blouses which allow for no hint of the bosom. Almost severe looking, they cut a dignified figure and completely complement the saree. More often than not, she treats a blouse with strict hand of minimalist designer – with a solid color and not much else when it comes to embellishments. These blouses do provide certain elegance to the saree and help hold it together, especially if you plan to wear it to a fashion event. In her creations, Anamika Khanna stays away from the done to death pinks and reds – the typical colors that a girl has come to expect in her wardrobe. She draws from western influences with dark colors and a dull, lack-luster sort of gold being the main features of her saree. When she does do pink, it is a subtle and soft pale pink with lace added as the mature element to garment. Her fun and rebellion is all in the design and drape of the saree, not the colors as we have all come to expect. Her regular designer saree is far from average, drawing the gaze from a mile away. She uses powerful color combinations to her advantage and relies on bold work to emphasize on the style statement. Thick borders are a common trend across these sarees as well. She lets her blouses take some of the attention in these creations and gives them an important role to play with checkered patterns and embellished finishes. Her sarees make for an impeccable choice if you want to be a head turner, and which girl doesn’t? There’s more coming up! If you liked this, stay tuned for more fashion designers and their best creations.